Considered by Japanese botanist Moto Shimizu as being a variation of Lilium maculatum at one time, Lilium wilsonii does bloom true from seed with each generation indicating a true species. 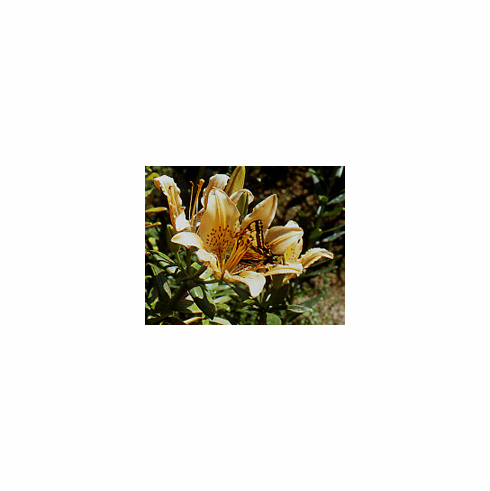 For us, it blooms earlier than Lilium maculatum and is of shorter stature. This photo with butterfly was shot on a day when temperatures were in the mid 90's in a bed of Lilium wilsonii being grown by Ed McRae at Lava Rock Nursery in 2006. There were hundreds of butterflies working the flowers that day as it was the only moisture available, many fighting with each other unwilling to share a single bloom. Photo insert is of 'L. wilsonii' as grown by Pontus Wallsten in Switzerland showing a little more of a pink-apricot cast to the flowers. Copyright Pontus Wallsten, all rights reserved. Used with permission.